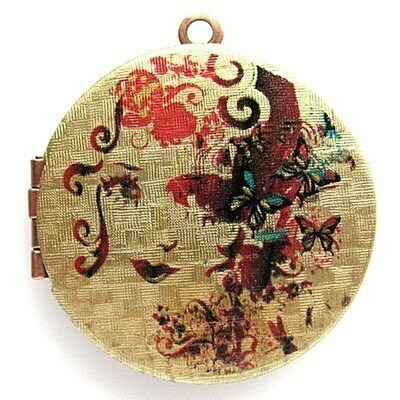 I have become addicted to the gorgeous handmade creations on Etsy. Such an array of "artyfacts" to suit my fancy. I can see my house filling even more with tonnes of them. Before I bankrupt myself buying from them and make it impossible for anyone else to get their hands on the lovely stuff , I thought it best to share a few of my favourites. It's a corset, it's rococo, it's got black and white stripes... and ohhh my, it's got Marie Antoinette on it. I have died of corset envy! The few at the store are just too fabulous to choose between so I shall drool enviously until I can decide upon one. ...there's even one with a skeleton panel in it. It's so fabulous that if darling John Entwistle weren't already dead the sight of a girl wandering around in it would kill him all over again. I love the concept behind this particular shop - "dress in art" which is generally what try to do a lot of the time, right down to my Botticelli print umbrella and Marilyn Monroe shoes. 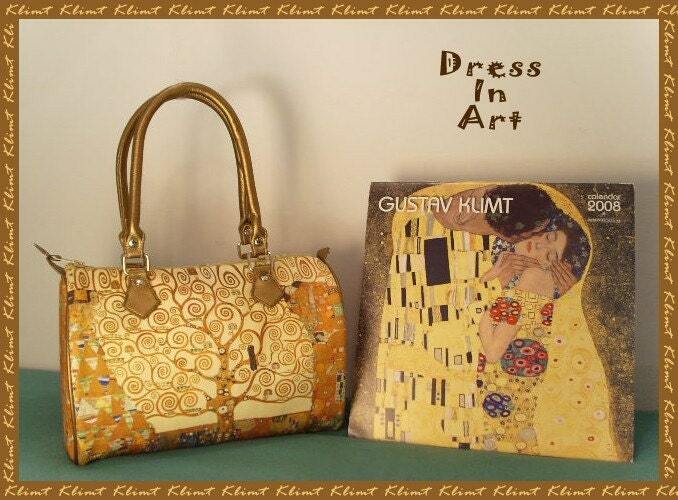 Above is the gorgeous Klimt handbag but I'm also rather taken with their Kandinsky skirt and the Mondrian bag... and, well, I'm deffinately keeping my eye on this store until one item screams "BUY ME!" The real gems here are the gorgeous lockets covered with fabulous art on the outside before you even start to think what to put on the inside. They're on sale at the moment so get over there!!! 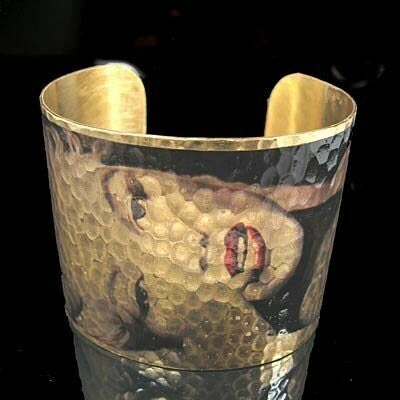 ...there's quite an array of fabulous bangles too and I've already treated myself to *one* of the Marilyn ones. Isn't this one of the most divine things ever?! I have enough Marilyn Monroe handbags to use a different one each month of the year... and yet I am now craving a Marie Antoinette handbag too. They have more utterly delish historically inspired frilly bags and cushions in their shop. Yummy!!! 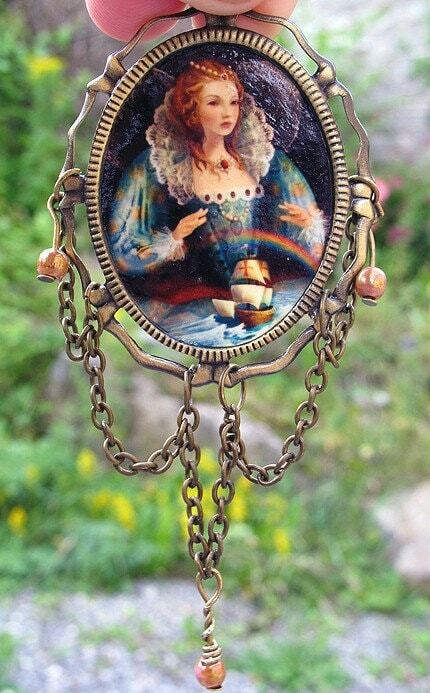 You can't have this broach as it's already mine, but isn't it just beautiful?! It's based on the artist's painting 'The Queen and the Explorer' Featuring Queen Elizabeth poised in symbolic blessing of her explorer sir Francis Drake's ship. They've also done Wuthering Heights, Dorian Gray and ther most hilarious Madame Pompadour art. 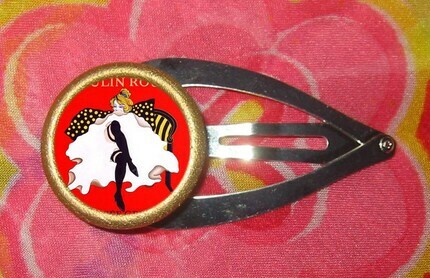 I love your corset with Marie Antonine!